Get twice the meaty, cheesy flavor with this DOUBLE DECKER Tacos Recipe. 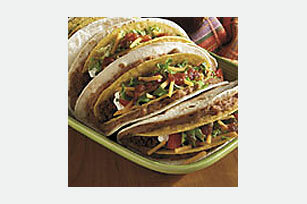 This DOUBLE DECKER Tacos Recipe incorporates soft tortillas and hard taco shells. Spread each warmed Soft Tortilla with 2 Tbsp. beans; place crisp taco shell on beans, then fold soft tortilla over taco shell. Fill taco shells with seasoned meat; top evenly with cheese, lettuce, tomatoes, Salsa and sour cream. Remove tortillas from pouch. Place on microwaveable plate. Cover tortillas with plastic wrap. Microwave on HIGH 1 min. Substitute 3 Tbsp. BREAKSTONE'S or KNUDSEN Sour Cream or 2 Tbsp. prepared guacamole for the refried beans. Substitute 1 lb. boneless skinless chicken breasts, cut into strips, or ground turkey for the ground beef.